Please refer to our stock # 5782 when inquiring. 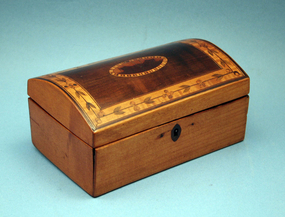 Antique Tunbridge Ware Dome Top Box, in satinwood, inlaid with other exotic woods in a leaf and berry pattern. Circa 1830.